BelarusDigest > All > The Jamestown Foundation: Will Lukashenka Be Welcomed in Prague? Since last October, the European Union, through an Eastern Partnership Program originally initiated last summer by Poland and Sweden, has taken several steps to normalize relations with Belarus. For some members of the opposition, the maneuvers appear to abandon the EU’s former insistence on democratization prior to the renewal of relations and the end of Belarus’s isolation. The EU thus appears to be establishing a buffer zone of friendly countries on its eastern border while ignoring some of the more unsavory aspects of the Belarusian state. A particular source of interest to many observers is whether Belarusian President Alyaksandr Lukashenka will be invited to the forthcoming EU summit in Prague in April (the Czech Republic holds the chairmanship of the EU until June), in what is called the 27+6 format, that is, the full members of the EU, plus Georgia, Armenia, Azerbaijan, Ukraine, Moldova, and, possibly, Belarus. Speaking in Minsk on January 26, Lukashenka linked the closer political relations with the development of business, welcoming the opening of a European Commission office in Minsk and the invitation to his country to participate in the Eastern Partnership Initiative [EPI] (Interfax, January 26). He had declared a few days earlier that “Belarus is a predictable, honest, and consistent partner in the international arena and makes a serious contribution to security and stability on the European continent” (Zvyazda, January 20). To facilitate and hasten the improvement of relations, on October 13, 2008, the EU issued a six-month suspension of the travel ban on Lukashenka and 35 leading officials (Reuters, October 13, 2008). It has now reduced its original 12 requirements for improving relations with Minsk to five: an end to the detention of political prisoners; changing the electoral code; resolving the issue of restrictions on independent newspapers and the law on the mass media; improving working conditions for NGOs; and freedom of assembly and political associations (Komsomolskaya Pravda v Belorussii, January 23). Several steps have been taken to date by Minsk, including the release of political prisoners (so designated by the United States), signing the Framework Agreement and Protocol of the EPI, consulting with the OSCE about changes to the electoral code, and the registration on December 17, 2008, at its fourth attempt, of the “For Freedom” movement led by former opposition presidential candidate Alyaksandr Milinkevich (www.by.milinkevich.org, December 18, 2008). Two leading opposition newspapers, Nasha Niva and Narodnaya Volya, are now sold in kiosks, although they are still difficult to find even in central Minsk, minimal copies are available, and the prices have been raised substantially by state agencies. The EU has chosen to drop or shelve seven other requirements for Belarus, including investigations of the disappearance of several prominent figures in 1999 and 2000, the abolition of the death penalty, ending arbitrary arrest and detention, and guaranteeing the rights of national minorities. Several opposition figures have expressed their anger at such apparent largesse, including Stanislav Shushkevich, a former parliamentary chairman; Lyavon Barcheuski, the leader of the Party of the Belarusian Popular Front; and Andrei Sannikau, the international coordinator of Charter 97 (for example, www.charter97.org, Jan 26). In an interview with the Ukrainian newspaper Zerkalo Nedeli, Shushkevich commented that “Some politicians in the West are indifferent to whether we have democracy” and stressed that Lukashenka should not be invited to Prague (Zerkalo Nedeli, January 24-30). Likewise, Volha Kazulina, daughter of former political prisoner Alyaksandr Kazulin, maintains that the regime’s measures have thus far been merely for the sake of appearances and do not represent any fundamental change (www.charter97.org, Jan 29). Other opposition figures are prepared to give the new relationship a chance to succeed, including Anatol Lyabedzka, the leader of the United Civic Party, and Milinkevich, who has already announced his candidacy for president in the elections scheduled for 2011 (www.naviny.by, January 14). Ending the isolation of Belarus within Europe could open up potential opportunities for opposition politicians. 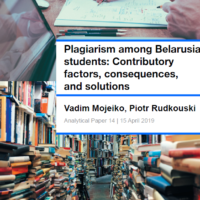 It could, however, also serve to maintain the authoritarian regime in power indefinitely without addressing most of the issues that led to European and international concern abut the political environment within Belarus. Despite pressure from the EU for improvements, the parliamentary elections of 2008, like all elections since 2001, were seriously flawed according to monitors from the OSCE (RIA Novosti, September 29, 2008); but the EU has decided to reassess the suspended Partnership and Cooperation Agreement with Belarus that has been shelved since 1996, when Lukashenka amended the constitution to enhance presidential powers. Moreover, the talks and discussions between Minsk and Brussels may founder on the issue of Belarus’s tightening economic and military-security links to Russia. Numerous questions arise. Will Belarus abandon its commitments to the Eurasian Economic Community with its free trade zone, the CIS, the generally dormant but not yet defunct Russia-Belarus Union, dismantle the two Russian military bases on its territory, and cease to purchase Russian weapon systems? Will the struggling Belarusian ruble be devalued further, or will Lukashenka finally succumb to using the Russian ruble in Belarus? Although Belarus trades as much with the EU as with Russia, the latter is the chief buyer of Belarusian manufactured goods and sugar as well as the country’s chief creditor and supplier of energy resources. In short, can the EU really extract Belarus from the Russian orbit into which it is increasingly drawn despite official rhetoric from the president and Prime Minister Syarhey Sidorski? Partnership, after all, is an alternative to, rather than a form of preparation for membership, which has never been on the table. Finally, if Lukashenka is invited to Prague, will this “erase” his past misdeeds?